I am always looking for different snack bars to keep me going through the day. I am trying to cut down on sweets and chocolate and I don’t always want to have fruit. I want something I can eat to keep me full between meals and that is healthy for you. 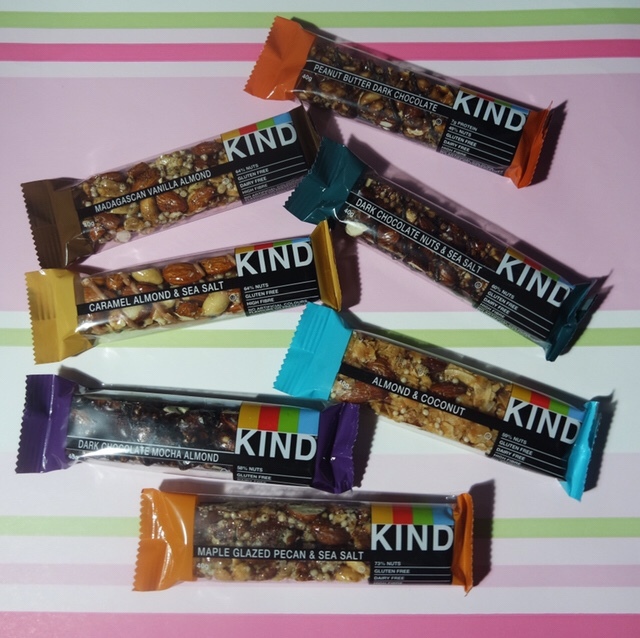 At the moment I am really into these bars from Kind as they are a good healthy snack that is easy to keep in your drawer at work or in your hand bag for on the go. I am really enjoying trying to have more nuts and seeds in my diet so these are great. Some of them have chocolate but are still dairy free as they use dark chocolate. They are also all gluten free. I do try my best to have as little dairy/gluten as I can as I have noticed a massive difference in my acne from cutting down on these. Kind have a massive range of bars, my favourite is the maple glazed pecan and sea salt. What I like most about the bars is how filling they are. I am excited to try the dark chocolate nuts and sea salt. At the moment I’m loving Alpen Light bars (only 70 calories). They have cherry bakewell flavour, Jaffa cake flavour, chocolate, summer fruits etc. — they are so good. These sound more exotic though! Perfect little bar to start your day with! I’ve seen these around a lot but have yet to try them. My favorite part of the day is when I get around to my protein bar! It’s so yummy. These sound lovely, i wish i liked nuts! I’m dying for some healthier snack alternatives – these sounds absolutely delicious, I’m going to have to give these a try! I’m looking for some healthier snacks. I tend to eat these Oaty Slice bars, which are supposedly healthy, but I’m not sure they actually are healthy! I’m going to keep my eye out for these!